Last autumn, after at least a year of thinking about it, I finally decided that I would start a blog. The focus of this is to share my experiences of the book world, the wonderful authors and the amazing books that I know many of you will want to read. those I have actually bought. I will state at the end of the review if it comes from netgalley or the publisher as there may be considerations of availability, although I will check on UK publication before writing up a review. I receive no financial inducement for writing these reviews and it really is a matter of my own personal choice. This is about sharing the books I really enjoyed, it is not about slating an author’s work, so I will only include those that I have really liked. I hope you enjoy my bookshelf as much as I do. 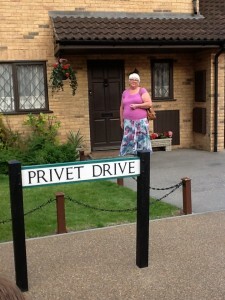 Outside Harry Potter’s house, as I am sure most of you know. The studio is well worth a visit. Many thanks in advance, and for your support of Anne’s blog. I wanted to write and say a big thank you for the super review you gave to “Fleeced!”. It’s my first published book, and a real labour of love and represents a long struggle to get into print. I came across your review in a glum moment at work, and it totally lifted my afternoon. Thank you so much! Since then I have been avidly reading your blog and am thoroughly enjoying it. PS – the anti spam words that have come up for me are “ram dandy”! Is this a sign? Aries would be well-chuffed! I am glad you liked the review, I really am looking forward to further adventures from Aries. There will be a further review of the book in the latest edition of the School Librarian, so look out for it. Can I ask where you are based as i might catch up with you at events in the future. I am in the Bristol/Bath area. Just spotted your lovely response to my ping! Thank you! I am based in Rugby and am hoping to do the Chipping Norton Literary Festival next year. I might get to Bath one day, though (if they’ll have me!). It’d be brilliant to meet up though, and thank you so much for your support! It means a lot. The sequel to “Fleeced!”, called “Rampage!” is due out in April. I hope you enjoy that one too! It’s set in the Amazon rain forest, filled with bugs and squirmy things… and you can just imagine how Aries “enjoys” that! lovely to hear from you. Congratulations on the forthcoming book, I hope to read it and will have a word with your publisher. Unfortunately I don’t get up to your area very often, the closest I will get this coming year is Grantham in April (Federation of Children’s book groups) and Stone in Staffs in June (School Library Association), but it would be great to meet if you get to with either of these conferences. Stone is probably do-able for me – I pass it on the train often when visiting my sister in Stockport. Let me know the details and I’ll see what I can do! Good morning Julia and a happy new year. The SLA conference is at Yarnfield Park Training and Conference Centre on the 12-14 June. You can see details for it on the School Library Association website. Do you know if your publisher is going to be exhibiting at the conference? This is just to let you know that Aries’ second adventure, ‘Rampage!’ is out on April 2nd (Piccadilly Press) and I would be delighted if you’d like to review it. My novel, “Entering the Weave” has just been accepted by http://www.britainsnextbestseller.co.uk . This is terrifically exciting for me, but in order to set up my page I need get three reviews for the book. Now obviously my mum and wife, friends and relatives are all queuing up to give me their amateur opinions, but I think it would carry more weight if I could get a professional review. My elevator pitch is “Harry Potter enters the natural Matrix” The hero has to save the world from a malevolent alien intelligence by learning to manipulate the Weave – the shared dream of all living things. If you’re willing to give it a read, please let me know and I’ll send it across in whatever electronic format suits you best. Obviously you’d be under no obligation to review it, but please don’t send it on to anyone else and if I’m to use your review then I’ll need it back by 14th October. many thanks for the message. It is a shame that you had not written earlier as I could have told you about the Nosy Crow conference that I attended yesterday. It was full of budding authors and illustrators, all there to listen to publishers, agents and published authors talking about the way the system works. First of all can I congratulate you on your fantastic blog. Your passion for children’s literature is infectious. Anyway, I understand you will be busy, but I’m writing to see if you would consider reviewing (or at least looking at) my independent children’s book (9-12) ‘The Time Hunters’. I would be delighted to send you a review copy of the first book as a paperback (if you’d let me have your address) or as a PDF. My email is carlashmore@mailcity.com. Anyway, your blog is fantastic and I hope you are well. I certainly would understand if you don’t have the time or inclination to do this. many thanks for your message. I have actually got all three of the books on my kindle and have started reading the first. At the moment I am not sure whether it will get into a review but I am contemplating writing a post on timeslip/timetravel, so it may come into that. I will look forward to the final book when it comes out and good luck for your writing future. I hope you enjoy the books. I look forward to reading your post on time travel should you ever write it. I’m a British writer of fiction aimed at a young audience. My first novel, The Skull was published by Bloomsbury last year, and seems to have been well received (http://amzn.to/1w8P6Hx). My second title, @thelogician – just released – is a mystery in which even the detective is an enigma, and I’d love it if you’d consider reviewing it. It follows the story of two teenagers – Steven, a steampunk obsessed eccentric, and Becky, a streetwise, but rebellious classmate who find themselves drawn into a dangerous adventure by the mysterious Logician – a detective who appears only online, and who is as clever, resourceful and fallible as the Internet itself. Because the story is told entirely through social media updates, twitter feeds and Google searches, I’ve decided to avoid paper publication and release the book (entirely free) as an ebook. If you’d like to take a look, you can download it for free from Barnes And Noble: (http://bit.ly/1o4MBWM – I’ve also got it on Amazon, but they insist on charging for it!). If you’d rather, just email me and I’ll send you a copy. Thanks in advance, and I hope you enjoy the book. thank you for your message. I have downloaded the book and will give it a look at, steampunk is always a plus point for me. As always I do not promise to write about the book in my blog, but hopefully I can give you an idea of what I think and it may make it to the page, good luck with your writing. Just discovered your lovely blog and I really like your thoughtful and measured reviews – I was wondering whether you’d be interested in reviewing any of my work? I’ve published three short story collections and a novel, all aimed at the 8-12 age range – the first two collections are also available as eBooks. Details at http://www.robkeeley.co.uk. If you’d like any review copies sending over, please just e-mail me – address is above or on About Me at my website. I can get my publisher to send hard copy(ies) to your postal address if you like. I’ve just had a children’s adventure novel published by Pegasus Elliot MacKenzie that will very shortly be available from Red Lion books in Colchester. I would be honoured if you would consider it for future reading. The book is called ‘The Bucket’ by D J Cattrell. It is Illustrated in Manga by May Li who is the daughter of Simone Xue (Chairman of Colchester Chinese Cultural Society). thanks for the message and good luck with the book. I do not normally review anything Manga or Graphic Novel in style as I think there are some really enthusiastic and knowledgeable people out there and they do a better job. However if you still feel that it might be useful, I would look at your book, but as always cannot guarantee that it will get a full review on the blog. As I said, good luck with the book and keep writing. I am wondering if you found time to review ‘The Bucket’ which is doing ok out there now. It was a finalist in The People’s Book Prize 2016 and I have just been offered a contract for the second. (Don’t worry about the artwork by the way the adventure will take you away!) I now go into schools doing a story creation hour of fun and actually that is a prize all in itself. To hear children giggling en-mass is as good as writing. I have just been asked to do two story creation days for the Essex Book Fest next year so onwards and onwards! many thanks for your comment. I can only reiterate my words to other people, yes I would be happy to look at your book but cannot guarantee to do a full review. However I do put comments up on Goodreads as well, so there are several options. Can you send by PDF? Best wishes. I’m the author of scores of fiction and non-fiction books for children and adults, just making my first venture into YA with my new novel, Drift. It’s coming out on September 10th to mark World Suicide Prevention Day, which also happens to be 40 years almost to the day since my own sister’s death by suicide. I’d love to send you a copy if you feel you might review it on your blog. it is lovely to hear from you. We met at a ‘meet the author session’ that I ran in Bristol in 2009 (doesn’t time fly). I would be happy to read the book and hopefully it will get reviewed, although I never promise. From the sound of the book it would best fit in with other YA reviews and I have got one on the go for later in the year. I will send my address via your contact details. thank you for the email. You can contact me at schoollibadvice@hotmail.com if you would like to send a pdf of the book. I never promise to review anything but will be willing to look at it and see if it might make the blog. As a blogger, you are an enthusiastic reviewer of children’s picture books so I believe you could be interested in adding some great new books to your collection. This is a new series which was designed to be read aloud by parents and teachers to their children. With witty rhymes, quirky humour, tricky tongue-twisters and lots of cues for interaction, the series aims to entertain adults and children alike while they enjoy quality time together. Would you be willing to kindly evaluate the books and publish reviews if you like them? I would really value your opinion and your support would really help me a lot. If so, I can send them to you for free, so you don’t have to purchase them. Is Kindle format Ok for you or would you need a hardcopy? when it closes out tonight? how animals grab a bite? never you mind the dangers. as he fills all the mangers. so much that it floods the zoo? Who will be left on the plains? Shall we go see, me and you? wear a float around your waist. as we have no time to waste! My name is Cathy and I found you while searching online. I hope that you’ll be interested in reviewing my story about wild mustangs in the American west. It’s a fictional account of the horses and great for anyone around age twelve and up. I actually began writing it as a teenager, having reworked and completed it last year. I’ll include some links here and if you’re interested, I can send a mobi, epub, or pdf file. I could also send you a coupon code for a free download at Smashwords. Please just let me know which would be most convenient. A black colt is born into an exciting and dangerous world. Will his parents be able to protect him from becoming a victim? The wild mustangs encourage and protect each other, but what will happen when the man and his tame horse show up? Can the mustangs save themselves or will they be forced to abandon all they’ve ever known? Thank you for your time and I hope to hear back from you soon. thank you for the information. Unfortunately I am at capacity at the moment, both with books for the blog and also with reviews for a number of journals. However I do wish you luck with your book; horses seem to be coming back in to fashion as a subject at the moment. Thank you for your encouraging words and good luck getting through that TBR stack! I really like your blog and was hoping to send you a review request, but I can’t find contact info on here (I could just be completely missing it). Can you point me in the right direction? Also, I used to live in Bath, and miss it terribly.